Click here to find out how you can add permission holders and assign individual permissions. Permission settings are transferred to the server when the application is published. This setting automatically activates all other permissions. Permissions holders are allowed to administrate the application in the Applications module. 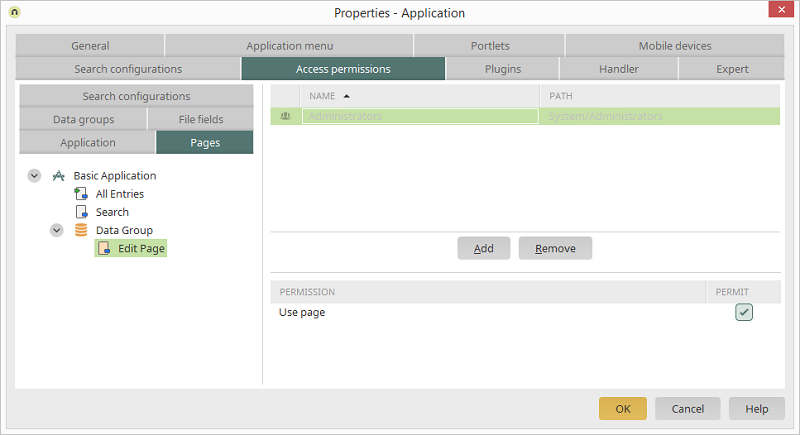 Permissions holders have access to the application link and the starting page of the application. The Administrators user group has full access to all pages and data groups of the application, as well as the application itself. This setting cannot be changed within the application permissions. 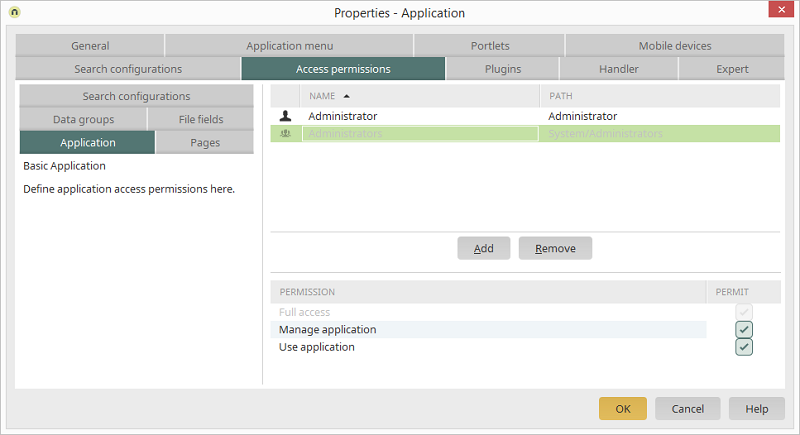 Remove a permission holder from the Administrators user group if you do not want them to have the permission to administrate applications. The creator of an application always has permission to administrate the application. This permission will be given automatically to the creator of an application. Allows you to provide access to individual pages of the application. If you select one or more pages on the left, you can determine the permissions for all of these pages on the right. All pages, which the user does not have permission for, will be automatically hidden from the application menu. Buttons that lead to an unpermitted page will not be shown in the browser. Here you will define in which data group data can be read, added to, modified or deleted. 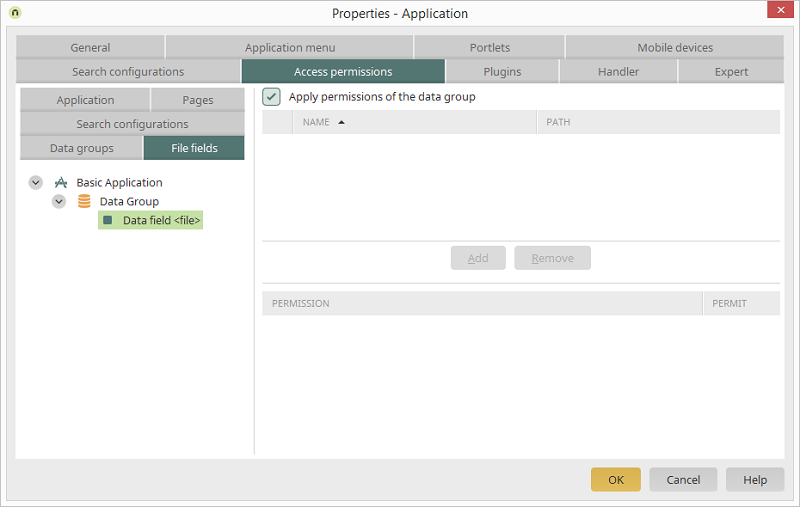 The data group permissions for Intrexx Share are controlled internally with Java classes and cannot be changed here. This setting automatically marks all additional permissions. 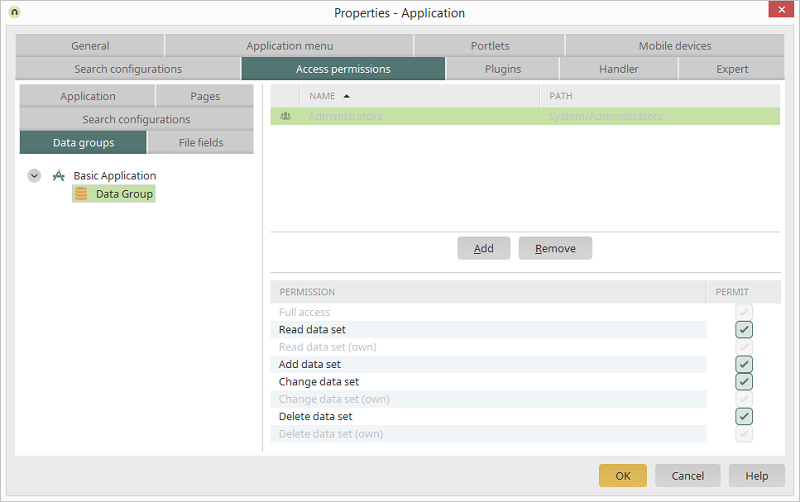 Permissions holders may read the data of an application. Permissions holders may read existing data records they have saved. Permissions holders may add new data. Permissions holders may modify existing data records. Permissions holders may modify existing data records they have saved. Permissions holders may delete existing data records. Permissions holders may delete existing data records they have saved. To do so, select the corresponding file field in the application structure in the left-hand area of the dialog. If this setting is active, all permissions configured for the data group will be applied to all file fields contained in it. The permissions for data fields can only be set individually if this setting is not active. If individual permissions are assigned to a single file field, a conflict check occurs. In the permissions table, the permissions will be highlighted in red if a conflict has been detected. A conflict occurs when permissions to a file field are assigned that, according to the data group, are not permitted. For example: A user may only read in the data group. If this user is given the Delete permission for a file field in the data group, a conflict occurs. The "Delete" permission will then be highlighted in red. Select the search configurations, you would like to define the permissions for, on the left-hand side of the dialog. 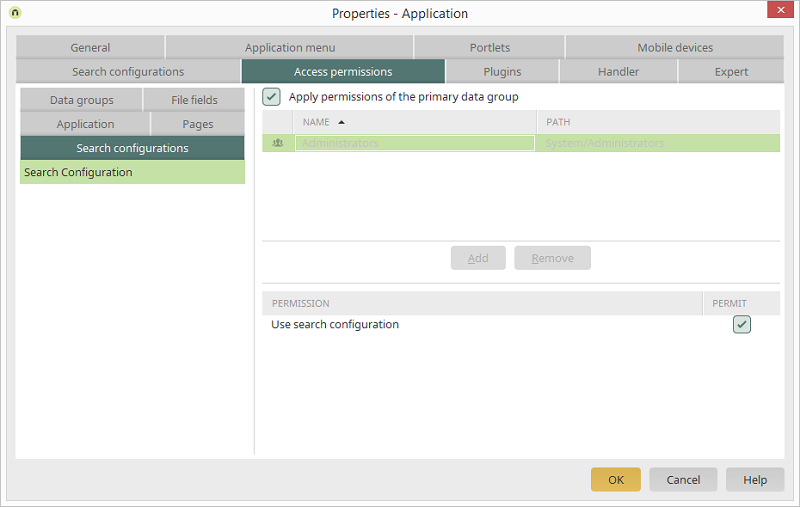 If this setting is activated, the permissions of the data group, which you have defind in the search configuration properties, will be used.